Hedges provide privacy and beauty in landscape design. 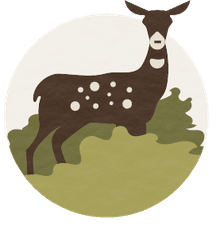 Many trees are well suited for hedges, but it's important to consider the purpose of the hedge and the growing conditions of the site when selecting a tree. Different tree species will have different characteristics and site needs. Remember that you will have to dedicate much more space to a tree than to shrubs. Abide by the tree's minimum spacing requirement, which can be found at your nursery. Deciduous trees in a hedge generally provide screening only during the spring/summer growing season. Evergreen trees, both broad and narrow-leaved types, are effective year-round hedges. Sometimes a flowering tree is desirable. Such trees may be pruned periodically but should be allowed to grow in their natural informal shape. The planting space required will vary based on the type of tree and the purpose of the hedge. For the most part, you will have to dedicate more space to a tree than to shrubs. Conifers used for tall screens require little trimming and should be spaced about six feet apart. Trees for informal or untrimmed hedges should be spaced farther apart than trimmed hedges. To assure a thicker hedge, place plants in a double row. Trees do not take training and pruning as well as shrubs. Most trees cannot be rejuvenated by pruning back to ground level. Trees do not fill in as well when topped - and most should not be topped. Shrubs will grow to fill the hedge much quicker than trees. Since trees take longer to fill in space and are planted farther apart, the initial planting may look sparse and take several years to achieve their desired appearance. Be patient and give your tree the time it needs. White Fir or Abies concolor (grows to 65'): This large, evergreen tree has a silver-green to blue color and is not as vigorous as other large evergreens. 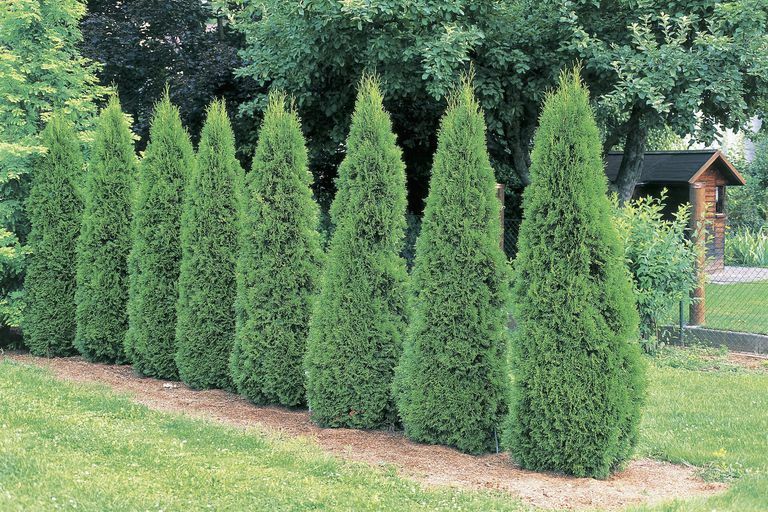 American Arborvitae or Thuja occidentalis ( grows to 30'): These trees are useful for windbreaks or screens. Do not use in hot dry situations. Amur Maple or Acer ginnala (grows to 20'): Dense and compact, this tree requires little pruning and is useful for large windbreaks and screens. Carolina Hemlock or Tsuga caroliniana (grows to 60'): This dense compact evergreen tree can be used for windbreaks or screens. Cornelian Cherry or Cornus mas (grows to 24'): This is a dense and compact tree that grows small yellow flowers in early April and red fruit in the summer. American Beech or Fagus grandifolia (grows to 90'): Another dense compact tree that is useful for windbreaks or screens. It is usually expensive and may be difficult to transplant. American Holly or llex opaca (grows to 45'): A thorny broad-leaved evergreen with colorful fruits, the tree may be winter injured in northern areas. Chinese Juniper or Juniperus chinensis ‘Keteleeri’ (grows to 20'): This is a loose evergreen with light-medium green leaves and a pyramidal form. Canaerti Juniper or Juniperus virginiana ‘Canaertii’ (grows to 35'): This is an Eastern red cedar cultiva with dark green leaves and pyramidal form. Osage Orange or Maclura pomifera (grows to 40'): Use this dense and compact thorny habit only for tall hedges where other plants won’t survive. It's useful for windbreaks or screens. Leyland cypress (grows to 50'): This fast-growing, beautiful, and dense conifer can quickly outgrow its space and subject to major canker disease. Plant with caution. Norway Spruce (grows to 60'): This dense compact narrow-leaved evergreen tree needs consistent shearing but is useful for windbreaks or screens. Eastern White Pine or Pinus strobus (grows to 80'): This is another dense compact evergreen that needs shearing but is useful for windbreaks or screens. Douglas fir or Pseudotsuga menziesii (grows to 80'): Here's another dense compact evergreen tree excellent for windbreaks or screens. However, it can be difficult to grow in some locations.